This is incredible. 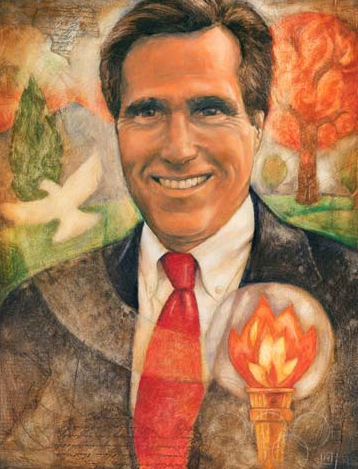 Via Mother Jones magazine, this portrait apparently exists at BYU. I'm getting some Olympics, some dove, maybe a torn scrap of the constitution here and there. But one more part... is that supposed to be the tree with the golden plates in the background? I don't know much about Mormon imagery. Also, where's the magic underwear? It should be featured prominently in the next one they draw.